Don’t make these mistakes booking in Arlington. Having lived in Arlington, VA and Washington, D.C. for several years My wife and I are always being asked about where to stay when visiting Washington, D.C. and Arlington is usually our most common suggest for so many reasons. But, there are things to watch out for, the most common mistake people make when booking a hotel in Arlington, VA is failing to find a hotel close to the Metro. There are over 20 hotels within walking distance to one of several Metro stations in Arlington, VA. Plus, on weekends hotel rates near the Metro tend to drop as business travelers leave the area making it even easier to find a hotel. The second common mistake is booking a hotel in Arlington’s grittier neighborhoods. Arlington is home to a few pockets of lower socio-economic areas, these areas can make tourist feel uneasy at night where crime is higher. To avoid these areas stick to hotels around the Metro stations and hotels mentioned on this page. The third mistake is book a hotel in Northern Virginia, for example an area like Falls Church. When you browse major booking sites they may begin to suggest hotels outside of Arlington further into VA suburbs. Be careful you are not chasing a deal on a hotel in the suburbs of Northern Virginia. Getting from Arlington to D.C.
Q: What Are the Best Hotels Near Arlington, VA Metro Stations? Answer: There are 4 primary Arlington, VA Metro stations that have hotels within walking distance. The stations we suggest considering first are Ballston and Rosslyn. Each station has a handful of hotels nearby that will cater to all Washington, D.C. travelers including families, romantic getaways, and economy driven travelers. My wife and I lived in Ballston for 3 years and it is a charming urban pocket with many restaurants nearby. Rosslyn is ideal because it is across the Potomac River from downtown DC, Georgetown and the National Mall. It is the intersection for all of DC’s bike trails, and a quick ride to Smithsonian Museums. Many of the hotels in Rosslyn have excellent views of the city. Read more about the neighborhoods below, or click here to look at a complete list of hotels near Arlington, VA Metro stations. Runners up to these options include the Crystal City Metro station and Courthouse Metro station. Hotels near Arlington’s Courthouse Metro station are a good runner up to Ballston with the same basic neighborhood vibe. Lots of people will consider Crystal City adjacent to Reagan National Airport. Crystal City will lack charm, but will offer up a large variety of hotel options and that can bring about cheaper rates. Read more about the neighborhoods below, or click here to look at a complete list of hotels near Arlington, VA Metro stations. Q: What Are Cheap & Reliable Hotels In Arlington, VA? Answer: Arlington, VA is home to cheap and reliable hotels that are hidden gems for value minded travelers coming to Washington, D.C. Without hesitation the best cheap hotel in Arlington is the Americana hotel (image above). The hotel is a 10 minute walk from the Crystal City Metro. At Americana parking, wifi and breakfast are all included. There is also a free shuttle to DCA. Often on the weekdays rates can hover $75 to $100 below other hotels. Reviews don’t rave about the hotel’s amenities, but provide an accurate description of the hotel reliable economy minded nature. The table below contains our other suggestions for cheap hotels in Arlington, VA. You may find that the Red Lion is often the most affordable day in and out. To always find the best deal be sure to read about our exclusive tools for finding hotel deals in Arlington. Answer: It goes without saying that “best” means something different to every single person. Therefore, when my wife and I set out to list the “best” hotels in Arlington we wanted to profile several different kinds of hotels. If best to you means the amenities and service than we like the Le Meridian with excellent views of the city (image above) that set the tone for a romantic getaway in Washington, D.C. If best means a mix of value and location than we like the Comfort Inn in Ballston for its free parking and proximity to the Metro. 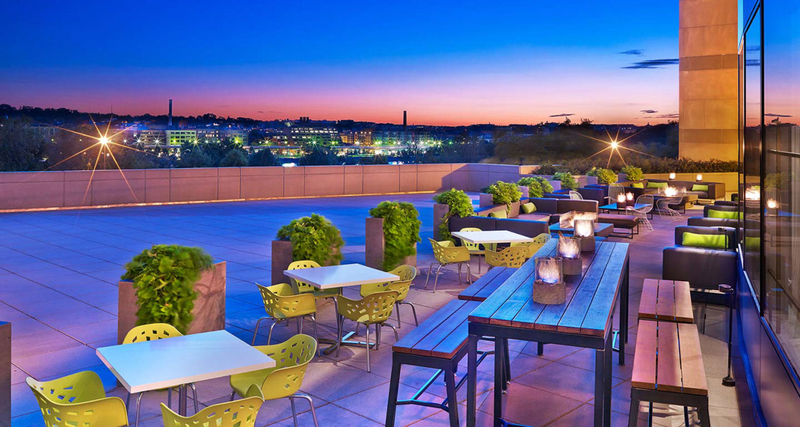 The table below highlights what we believe are the top 5 accommodations in Arlington for a variety of different trips to Washington, D.C.
Is Ballston Right for You? Ballston Neighborhood: With good proximity to downtown, highways, airports and the National Mall it is hard to go wrong at Ballston. This is one of the best locations in Arlington, VA. There is a yuppie vibe to it, but with that affluence brings charming squares and over 40 restaurants. A commute to the National Mall is about 20 minutes via the Metro. The urban area around the Metro quickly drops off into charming parks, and suburban Virginia. The Mall nearby has an ice rink which is an excellent way to beat the heat in the summer. Use the local Custis trail to ride a bike into DC in 30 minutes. Of the five hotels near the Ballston Metro the Comfort Inn is preferred because it offers free parking, breakfast and wifi. No other local hotels offer free parking. Is Crystal City Right for You? Crystal City Neighborhood: Crystal City offers tourist and business traveler’s immediate access to DCA Airport with a short commute to downtown DC, or the National Mall. Located in Arlington, VA altogether the area is a welcoming urban pocket. The neighborhood can empty out after business hours. Often the local residents are young professionals making their home in one of numerous luxury high rises that blend in with office buildings and hotels. Families should note Crystal City straddles a major highway, so those with small children should be cautious of traffic while walking around. With plenty of restaurants and access to the Mt. Vernon trail, DCA, Alexandria, and a short commute to all the tourist attractions Crystal City should always be considered when visiting Washington, DC. here are over 10 hotels within a 10 minute walk of the Crystal City Metro station. Every traveler should consider the Americana Inn before looking into other hotels because you can save as much as $100 per night during the week (Sun – Thu) compared to the nearby brand name hotels. Is Rosslyn Right for You? Rosslyn Neighborhood: Rosslyn will be appealing to all travelers for its quick access to downtown, the National Mall and Georgetown. It is easy to walk to Georgetown, just cross over the Key Bridge. The Metro ride to DCA is about 10 minutes, and there is an express bus that can take you directly to Dulles airport. Active travelers will enjoy riding their bike to Smithsonian museums along trails. Rosslyn is home to mostly young professionals. This area is the commercial center of Arlington; you’ll find better nightlife and activity options in the Clarendon neighborhood one stop away, but can expect plenty of fast casual restaurants around Rosslyn. Is Clarendon / Courthouse Right for You? Clarendon / Courthouse Neighborhood: The Clarendon and Courthouse metro stations form the heart of bustling Arlington. A little less than a mile separates these two stations, but the area is a vibrant, urban center, and the section of Arlington that has the most to offer visitors. Full of luxury high-rises and single-family homes, Clarendon/Courthouse is home to affluent families and young professionals. hoppers will enjoy the mix of major retailers, like Ann Taylor and Pottery Barn, and independent shops, like South Moon Under, a local clothing boutique. Though the area can get a bit rowdy on weekend nights, this neighborhood is safe and welcoming. Q: What Hotels Have a Shuttle to DCA Airport (Reagan National)? Answer: All hotels in Pentagon City and Crystal City will offer a free shuttle to the DCA airport. The hotels listed below are also a short walk to the Metro meaning that you can get a free shuttle from the airport to your hotel and then walk to the Metro. Out of the group below don’t overlook the Americana because it often has the best rates and does well across online reviews. It is a 15 minute Metro ride to get from Crystal City to downtown or the National Mall making this area convenient to D.C. If you need to get from Dulles airport to Arlington, VA than we suggest staying in a hotel at Rosslyn and utilizing the express shuttle bus that takes travelers to Dulles from Rosslyn in about 45 minutes. Q: What Hotels Have Free Parking? Answer: Free parking is a rare hotel amenity in Arlington. Because Arlington sits so close to Washington, D.C. and often many hotels are close to a Metro station parking is rarely offered for free. While limited there are options, below are the three remaining hotels that offer free parking and are within walking distance to an Arlington, VA Metro station. Out of the group we suggest looking at Comfort Inn first. The seven block walk to the Metro is a quick walk through suburban town homes. The Red Lion is 15 minutes are from the Rosslyn Metro and you’ll have to walk up the hill. The Americana is a good hotel, but is located in Crystal City which most travelers will prefer less than to Ballston where the Comfort Inn is located. Q: What Hotels Have Suite Rooms for Families? Answer Families visiting on the weekends for vacations are in luck as hotel rates in Arlington drop and suite rooms become more affordable as business travelers leave. Below is a list of hotels in Arlington that offer suite rooms and are a short walk to the Metro. Out of the group we suggest looking at the DoubleTree near Pentagon City because it has a rooftop pool, and a revolving restaurant overlooking Washington, D.C. Families who want a modern clean suite room located in good neighborhood will appreciate the Residence Inn at Ballston which serves free breakfast daily and was built in 2015. Q: What Hotels Have Free Breakfast? Answer: We found eight hotels in Arlington, VA offer a free breakfast. Those are listed below. The list includes if the breakfast is only grab n go cold items, or includes hot items. Above is a picture of the breakfast buffet at the Residence Inn at Ballston. At Residence Inn, Hampton Inn and Hyatt Place a free hot breakfast is standard with every booking. All of the hotels mentioned below are within a short walk to the Metro. Q: What Hotels Have a Pool? Answer: There are 13 hotels in Arlington, VA that have an indoor or outdoor pool. The best hotel with a pool in Arlington, VA is the DoubleTree at Pentagon City (image above). The pool sits on an upper floor and is indoors. This means you can be taking a swim year round and enjoy nice views of Washington, D.C. Below we have listed all of the hotels with a pool and what type of pool it is. Q: What Hotels Are Best for Nightlife & Sightseeing? What Are Best Hotels for Sightseeing? Answer: Staying at a hotel in Rosslyn would be the best choice if you are seeking an ideal location for sightseeing in Washington, D.C. Often hotels rooms in Rosslyn face downtown D.C. and the monuments at the National Mall. Getting to the National Mall only takes about 15 minutes via the Metro Orange line. In addition Rosslyn is a short walk across the Key Bridge to Georgetown. Rosslyn also happens to sit at the nexus of all of Washington, D.C. bike trails. This means that you can ride a bike to the National Mall from Arlington in addition to many other destinations like Rock Creek Park, Bethesda, Great Falls, and Gravely point adjacent to Reagan National Airport. What Are Best Hotels for Nightlife? Answer: Without hesitation Clarendon / Courthouse is the best place to stay for nightlife in Arlington, VA. Therefore finding hotels near the Courthouse Metro will give you the best access to Washington, D.C. and nightlife. Clarendon nightlife spans from upscale dinner and drinks to late night food and rowdy clubs. The vibe is what you would expect when young professionals relive their college days. The nice thing about this area is that the crowds don’t get out of hand and the action is tame relative to other areas in D.C. like Adam’s Morgan. Are There Hotels Near Potomac River in Arlington, VA? 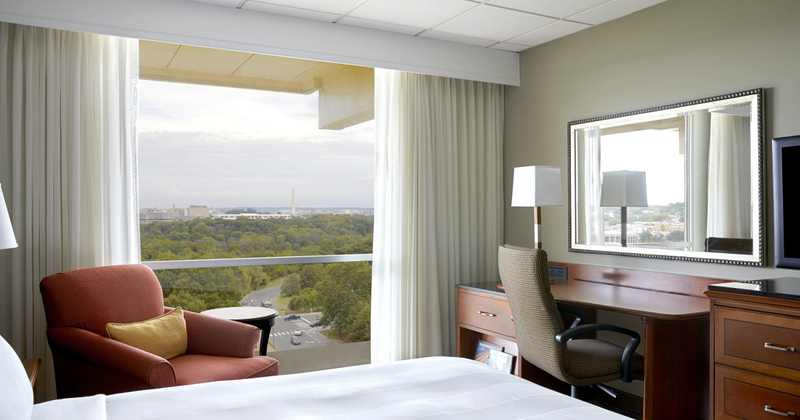 Answer: Hotels near the Potomac River in Arlington are located in Rosslyn or Crystal City. The Potomac River is home to the spectacular Mt. Vernon trail. You can connect to the trail in 5 minutes from most hotels located at Crystal City or Rosslyn, with Rosslyn being the closer of the two to the trail and river. Q: What Hotels Are Near Arlington National Cemetery? Answer: There are three hotels that are within walking distance to Arlington National Cemetery. Out of the three we suggest looking at the Sheraton ONLY if the many purpose of your visit to Washington, D.C. is to get easy access to the Cemetery. The problem with the Sheraton is that they charge $30 for parking and the location of the hotel is poor. It is not near anything else. Keep in mind that there is a Metro station at the Cemetery entrance. If your visit to Washington, D.C. is more comprehensive than just visiting the Cemetery you will want to look at hotels in Arlington near the Metro. This page extensively discusses that. Below are the hotels we suggest that are closest to the Arlington Cemetery. Q: What Hotels are Pet Friendly? Answer: There are four hotels in Arlington, VA with pet friendly policies. We suggest the Westin in Ballston as the best choice for pet owners because of its proximity to a park and square. Unfortunately hotels that allow pets also happen to be more expensive. Often what we found was the most hotels in Arlington that allowed pets had fees of $75 or more for cleaning. This made the hotel very expensive. These are the hotels with the most reasonable pet fees. Crystal City Westin Free. Up to 40lbs. Answer: Airbnb’s in Arlington, VA come at a high cost relative to the value of hotels. When we looked at common weekends tourist visit Arlington, VA Airbnbs that compare closet with hotels are more expensive. Below are the average cost of Airbnbs when you have the whole place to yourself, meaning that the host is not staying with you. These averages also don’t include cleaning fees, and other fees that Airbnb charges. Still you can always shop around to find a bargain. Usually people who are new to Airbnb have lower rates than people who have been offering their places for a longtime. To get $40 off your first Airbnb experience sign-up for Airbnb using this page. On this website we have exclusive tools to help you find the best deal on a hotel in Arlington, VA. You can use the deal finder tools by going to the station pages for each Metro in Arlington. Those pages are Ballston, Courthouse, Rosslyn and Crystal City. As you scroll down the page you’ll see the deal finder tool. Simply enter your dates. After you enter your dates you’ll be taken to HotelsCombined which searches hundreds of booking sites to find the best deals. The hotels results page at HotelsCombined will have all of the hotels organized by their distance from the Metro making it easy to sort results and find the best deal. You can also watch a video on how to do this at our Arlington hotel deals page. Q: How to Get from Arlington, VA to Washington, D.C.? By Metro: The most common way to get fro Arlington, VA to Washington D.C. is to use the Metro system. The Metro takes about 15 minutes to get from Arlington to D.C. By taking the Orange line in Arlington you will be able to arrive in downtown D.C. or on the National Mall in about 15 minutes. The Smithsonian station on the Orange line is on the National Mall. If you take the Metro from Crystal City in Arlington the Yellow line will have you in downtown Washington, D.C. in about 10 minutes, or at the L’Enfant Plaza Metro station which is the closest station to the National Mall. By Bike / Walking: There are three bridges with walkways that connect Arlington and Washington, D.C. The Key Bridge connects Rosslyn with Georgetown. The 14th Street bridge will connect the Mt. Vernon trail and the National Mall near the Jefferson Memorial. You can cross the Arlington Memorial Bridge to get from Arlington National Cemetery and Lincoln Memorial. By Car: There are four bridges that connect Arlington to Washington, D.C. tourist may find that taking I-66 places them in the best position to access downtown or the National Mall. Q: How to Get from Arlington, VA to DCA or Dulles Airport? Getting to Dulles from Arlington, VA: The 5A express bus route connects Dulles airport with Arlington, VA at Rosslyn. This is the best all around option if you want the most stress free method to get from Dulles to a hotel in Arlington and then have easy access to attractions in Washington, DC. Depending on the traffic anticipate spending between 30 to 45 minutes on the bus to get to Rosslyn. Getting to DCA Airport: The Metro is the best way to get to and from Reagan National Airport from most Arlington destinations. The If you are coming from Ballston or Courthouse you’ll have to switch from the Orange to Blue line at Rosslyn. If you are staying at a hotel in Crystal City nearly all hotels have a shuttle to the airport. Q: How to Get from Arlington, VA to Smithsonian Museums & the National Mall? Answer: If you are staying in Arlington at Ballston, Courthouse or Clarendon simply take the Orange line to the Smithsonian station on the National Mall. If you are staying in Crystal City take the yellow line to L’Enfant Plaza which is a few blocks from the National Mall and Smithsonian Museums. Biking is another option from Arlington. Hop along the Mt. Vernon trail heading south and then use the pedestrian bridge at 14th street. This will take you directly to the Jefferson Memorial area of the National Mall. Q: How to Get from Arlington, VA to Georgetown & Downtown D.C.? Answer: Getting from Arlington, VA is to Georgetown is easy, simply cross the Key Bridge at Rosslyn. From Georgetown you can make your way to downtown in about a 20 minutes via walking. If you want to get from Arlington directly to downtown take the Orange line to Metro Center, or if you are staying in Crystal City take the yellow line to the Gallery Plaza station at the center of downtown near the Verizon Center. When you look at a Map of Arlington, VA you’ll see that it is directly west of Washington, D.C. and connects with D.C. via the Metro as well as 4 bridges. The Potomac River divides Arlington and Washington, D.C. It is popular to kayak on the river. Arlington has two major urban hubs with suburban sprawl situated between them at various socio-economic levels. The main urban hubs with Metro stations are Crystal City which is home to the Pentagon and Reagan National Airport and the stretch of urban pockets along Wilson BLVD / Clarendon BLVD. There are five Metro stations along Wilson and Clarendon BLVD which in order of closets to D.C are Rosslyn, Courthouse, Clarendon, Virginia Square, and Ballston. A lot of what you’ll find online in regards to things to do in Arlington, VA is situated around Military Memorials which have a purpose and a place, but often are quite boring and somber. After living in Arlington, VA for several years my wife and I found these are the best things to do for sightseeing and tourist in Arlington, VA.
Go see the planes land at DCA from Gravelly Point. We’re not kidding when it feels like the planes might drop down right on top of you. You are about 100 yards from the runway and it is a rush. Have dinner at Amuse at Le Meridien. The views are pretty fantastic. Think opening credits to house of cards. Arlington sits up on a hill overlooking D.C. this makes for some excellent views. Ride a bike from Arlington, VA to Alexandria. My wife doesn’t even ride and she loved the ride from Ballston to Alexandria via the Custis and Mt. Vernon Trail. If you can churn out 15 miles on a bike it is seriously worth the effort. Have French Toast at Metro 29. This not your average French Toast it is totally unique and you won’t feel like doing much afterwards. Bar hop from Clarendon to Rosslyn to Georgetown to Washington, D.C. If you want to really see D.C. and don’t mind the trek it is an excellent way to burn off an afternoon and accomplish three things at once. Sightseeing, exercise, and drinking.